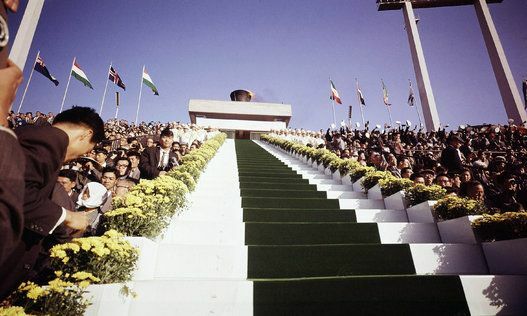 Stairs rising up to the Olympic cauldron at the 1964 Tokyo Olympic games. Photograph; Public Domain. he Olympic movement and the Olympic Games themselves are global canvases that nations and ambitious individuals have used to create powerful narratives and lasting impressions. Aside from the athletes themselves, these include governments, broadcasters, architects, graphic designers, companies, politicians and even on occasion poets and authors. Some have risen creatively to the occasion, while others have consciously sought out the Olympics to forward their agendas. And this, of course, can be said of Japan, which has a long and very special relationship with the Olympics. Many Olympic stories are inspiring, but some Olympic narratives end in disappointment, sadness or even tragedy. For every winner there are numerous losers and, at times, terrible unexpected events, such as the terrorist attack at the Olympic Village in 1972 in Munich, which created a very different type of impact and legacy. Nevertheless, the Olympics can still be an excellent lens through which we see a nation’s progress and its perceived position in the world. 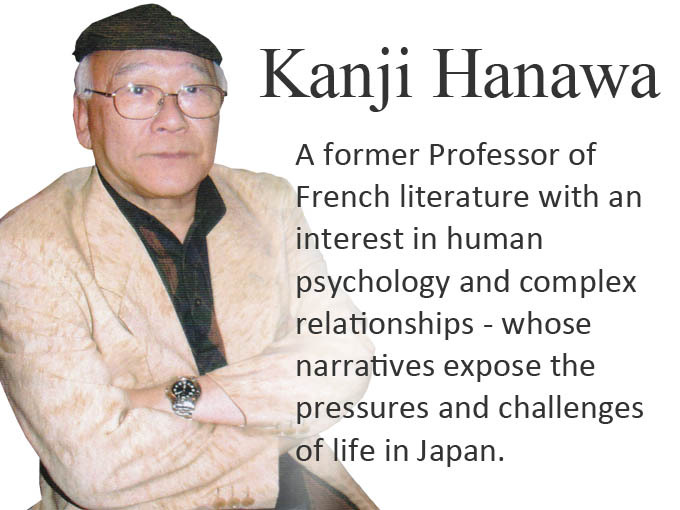 Writers inside and outside of any Olympic nation play an essential part in developing these important national narratives; and many brilliant Japanese writers have played their part. n 1909 Jigoro Kano (1860-1938), the founder of Kodokan Judo, became the first Japanese and the first Asian to become a member of the International Olympic Committee (IOC). An initial invitation to Japan was reportedly declined in 1906, but Kano was invited, and accepted to join, after Japan’s victory over Russia in the Russo-Japanese War (1904-1905). 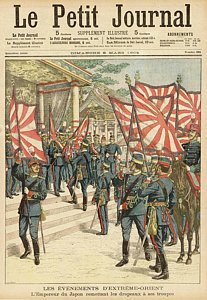 A war that halted Russian expansion in the Far East; and a victory that took most of the world, except Japan’s increasingly confident leaders, by surprise. It was the first time in modern history that a European power had been defeated by a country in Asia, and it created instant interest in Japan as a result. Japan sent its first official team, a two-man team, to the 1912 Olympics in Stockholm, the fifth modern Olympics. From these small beginnings Japan’s participation in the Olympics progressed. By 1924, Japan had an Olympic team of 28 equipped by a corporate sponsor, Mizuno – the first of many Japanese companies that have since supported the Olympics. Mizuno has now grown from a shop run by two brothers from Osaka that opened its first Tokyo office in 1912, the same year as the Olympics, into a major global sportswear brand. Mizuno grew initially by making and selling baseballs. They then supplied custom uniforms for the growing number of sports teams in Japan, predominatly baseball teams set up during this period when Western sports were imported and encouraged, enjoying great popularity. It didn’t take long for Japan to win medals. The following Olympics, in 1928, saw Mikio Oda (1905-1988) win a gold medal in the triple jump (15.21 metres) and Yoshiyuki Tsuruta (1903-1986) win gold in the 200-metre breaststroke (2 minutes, 48.8 seconds, a record time). At this Olympics, Hitomi Kinue (1907-1931) became the first Japanese woman to win a medal – silver – in the 800 metres, finishing a few tenths of a second behind the German winner and ahead of the runner from Sweden in a fast and fiercely competitive race. All three women broke the world record. Japan’s Meiji Era (1868-1912) of massive social and cultural change had ended. Before this era Japan had cut itself off from the world for hundreds of years and lived by and large in peaceful isolation. But by the 1900s an increasingly confident Japan was ready to spread its international wings. The Meiji Era was a revolutionary period not dissimilar to the digital age, but even more pronounced. New printing technologies and universal education (for men and women) spawned all sorts of change in Japan, including new types of information becoming available for the first time, the launch of new publications, and the arrival of unfamiliar sports like baseball, rugby, tennis and golf. Some Japanese sports were also reinvented and modernised. Literacy rates doubled to nearly 80 percent – higher than most countries – and virtually all children remained in the education system up to the upper secondary level. Sport was considered an important part of developing the nation’s youth and the education of the nation’s children. The massive increase in the number of publications provided opportunities for exceptional Japanese women and men with a creative outlet, and opened up an accessible emerging mass market of voracious readers of books, magazines and newspapers. itomi Kinue, Japan’s first female Olympic medalist, wrote as well as ran. Other commercially successful female writers in Japan at this time included the romance writer, Nobuko Yoshiya (1896-1973). She wasn’t an Olympic athlete; but what she lacked in athletic prowess was more than made up for by her independent and adventurous spirit. She lived openly as a lesbian and wrote a novel titled Two Virgins in the Attic, in 1919. Ten years older than Kinue, Yoshiya is credited with inventing the romance genre in Japan. Another pioneering Japanese woman was Chiyo Uno (1897-1996) who, having found success as a writer, left her first husband to follow her dream of living life as an independent modern woman. She went on to start her own fashion magazine, Style– and when she eventually died in 1996, The New York Times ran her obituary. 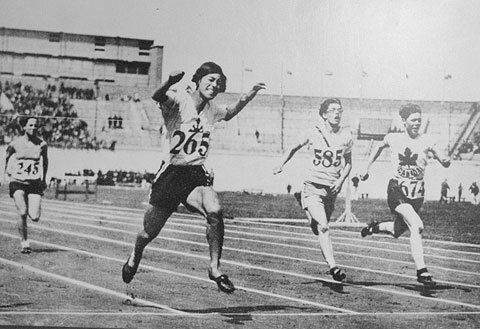 Hitomi Kinue (1907-1931) running the 100m heat at the 1928 Amsterdam Olympics. In 1920s she was the record holder in several events and was the first Japanese women to win an Olympic medal. Photogragh taken 30 July 1928. Credit: Wikipedia. We will probably never know if Kinue read books written by Yoshiya or Uno. But we do know that she was Japan’s first-ever female sports journalist, working at the Osaka Mainichi Shimbun and she could write as well as run the 100 metres in 12.4 seconds. But in contrast to most Japanese women writers of her age, Kinue’s success was international, and was amplified by the status of the Olympics and its international presence. Her success generated massive media attention in Japan’s newspapers, magazines, and tabloids of the day. Life, however, wasn’t easy for her. She famously said: ‘ The entire process of life is a fight’. She came under the type of intense media scrutiny that was both personal and deeply hurtful. And the pressure eventually became too much for her to bear. 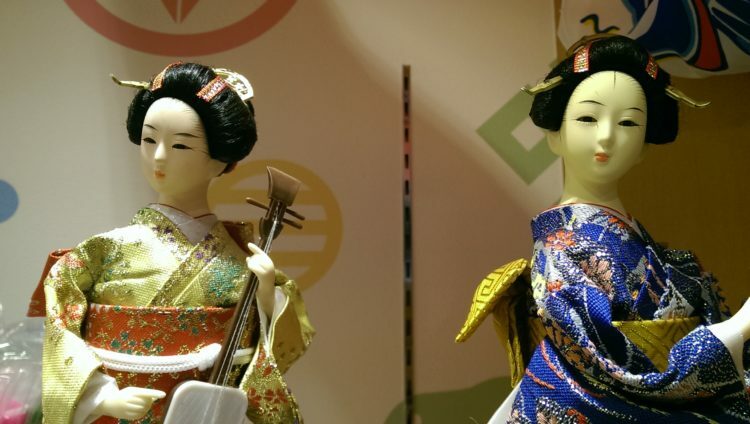 Some traditionalists in Japan began to question her gender and sexuality. The New York Times and various Japanese publications ran stories casting doubt on her gender, all of which took their toll on her. And she started drinking excessively. Kinue sadly died at the age of 24 at what should have been the peak of her sporting career. Nonetheless, she has become part of Olympic history and Japanese Olympic literature; and both her writing and her plight have become topics of academic literature and gender studies – including such academic papers as: Moving Forward: Sports and Gender in Modern Japan, published in the Graduate Journal of Asian-Pacific Studies. apan sent a large team of 115 men and 16 women to the next summer games – the 1932 Los Angeles Olympics. The team performed extremely well, winning seven gold, seven silver, and four bronze medals. Besides generating nationalistic pride at home, this success also inspired one of Japan’s first Olympic literary works, a bestselling novella by Hidemitsu Tanaka (1913-1949), Orinposu no Kajitsu, The Fruits of Olympus (1940). 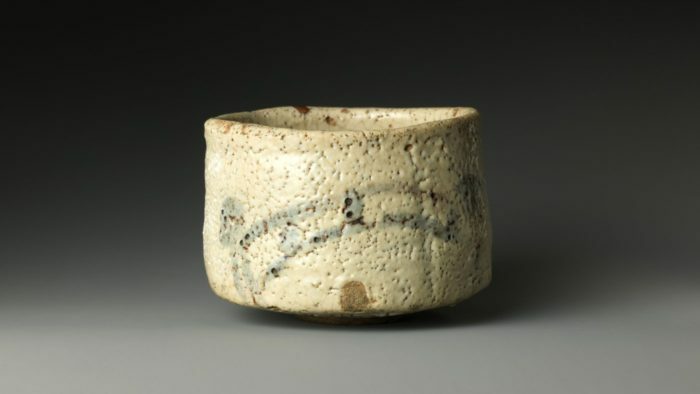 Like Kinue, Tanaka was another Japanese athlete who could turn their hand to writing. But unlike his predecessor, he was an Olympic rower. At the age 19 he competed in the Men’s Coxed Eights. But he and his Olympic crew didn’t bring back any medals from the games. In their final they came in second from last – only beating the boys from Brazil. In contrast, Tanaka’s novella was a success. A rite of passage novel about unrequited love, it is the tale of a young moody athlete, also a rower, leaving his country for the first time and representing it on the Los Angeles Olympic stage. It is not your typical Japanese sports book with an individual becoming a national hero by overcoming every challenge faced through extreme hard work and diligence. Neither is it packed full of brave accounts of nail-bitingly close competitions against dauntingly difficult competitors, leading to ultimate triumph. Much of the short novel takes place on the boat journey from Japan to the games in the United States. The novella’s protagonist, university rower Sakamoto, who is loosely based on the author himself, doesn’t enjoy all aspects of being part of an Olympic team. On the boat journey a female athlete (an 18-year-old high jumper) catches his eye and he falls for her, but relationships are strictly forbidden. He also worries that the Spartan hectoring approach to training might not in fact be the best way to prepare to win. Sakamoto is more of an anti-hero, unable to express himself, who sees strength in his opponents and the faults of his own. The Fruits of Olympus articulates the anxiety of youth struggling with young or first love, authority, peer-pressure and expectations: both his own and those of others. Elusive rowing success does not turn out to be Sakamoto’s answer, and he returns to Japan without fulfilling his dreams and is unable to rise to the challenge of even telling the high jumper how he feels. His novella was initially published in a literary magazine, Bungakukai, but became more popular in book format, particularly among schoolboys after Japan’s defeat in the Second World War. Perhaps, as some academics argue, Sakamoto’s international failure, his skepticism, and his inability to articulate his feelings, including those of defeat, reflected the feelings of many in post-war Japan. The book appears to have resonated in a similar manner to his mentor, Osamu Dazai’s (1909-1948) novel, No Longer Human, published in 1948, about a reclusive young man who feels ‘disqualified from being human’ but finds solace in literature. No Longer Human is also a schoolboy favourite that is often cited by contemporary male Japanese writers as their favourite book or one that influenced or ‘saved them’ when growing up. Tanaka’s novella initially included the word ‘apricot’ in its title, as Sakamoto is given an apricot by the girl he had fallen for in the story. At Dazai’s suggestion, the title was changed to Olympus. The book’s subsequent success is sometimes credited for starting the genre of sports literature in Japan, which is now dominated by manga and anime. 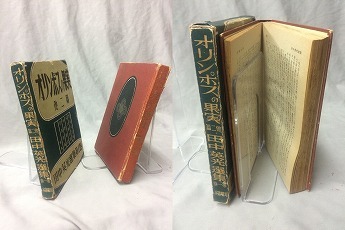 It is also said to be Japan’s first Olympic literary work. In the 1970s, Takeda’s novel received a new lease of life when it was adapted for television by NHK, Japan’s national broadcaster, as one of NHK’s Galaxy TV Novels, short dramas based on famous books, which were broadcast repeatedly after the evening news. In 1977, The Fruits of Olympus was broadcast nightly nationally, between 10 and 21 January, as the first episode in a four-part series on young men of the Showa Era. Tanaka who was briefly a member of the Japanese Communist Party (he was expelled for bad behaviour), wrote a second Olympic-related book Tantei Soshu, The Boat Rower (1944) among other books including a war memoir Yami no yo, A World of Blackness (1947), but he is best known for The Fruits of Olympus. Dazai was clearly a hugely influential figure for Tanaka and someone he admired greatly. Sadly, literary heroes can sometimes leave a toxic legacy. Ryunosuke Akutagawa (1892-1927), considered one of Japan’s literary greats after whom one of Japan’s most prestigious literary prizes is named, was someone Dazai himself idolized. Akutagawa’s tragic, but not unexpected suicide, had a major and profound impact on Dazai who also committed suicide two decades later after multiple attempts. In turn, Dazai’s untimely death had a terrible impact on Tanaka, who cut his wrists after taking sleeping pills at Dazai’s grave the year after his mentor’s death. He died shortly afterwards in hospital. Making this cascade-like cluster of suicides of three brilliant Japanese creative writers feel like an Olympic-sized Greek tragedy. All three men never reached their 40th birthday. Despite these individual tragedies, Japan’s confidence and ambitions as a nation continued to grow apace. Kano and others began to promote the notion that merely participating and winning medals was not enough; it was time that Japan hosted the Olympic Games itself, in Tokyo, even though, since 1896 the Olympics had only ever been held in Europe or the United States. Having competed with the best, and occasionally won, it is hardly surprising that Japan wanted to host an Olympic Games and show the world that as a nation it was an equal to the world’s Western powers. A formal bid was made at a hotel in Berlin prior to the 1936 Olympics. Tokyo was up against Barcelona, Helsinki and Rome in a race for international prestige. Aside from allowing Japan to take its rightful place amongst the world’s most important cities, hosting the games would also let Tokyo show the world that it had fully recovered from the devastating 1923 earthquake that destroyed much of Tokyo and killed over 100,000 people. Just under half of all homes were destroyed or rendered uninhabitable; and some predicted it would take Tokyo decades to restore the city to its previous status. Following the earthquake, Tokyo was in fact rebuilt in record time with more than 200,000 new buildings being erected and the city being largely re-planned. According to Japan-related Olympic academic literature and research papers including The Imperial Sportive: Sporting Lives in the Service of Modern Japan, the Olympic Games were also intended as a platform from which to define Japan’s cultural nationalism and further her international diplomacy. Kano and his team won with their very first bid, receiving no fewer than thirty-six votes. And it was agreed that Tokyo would host the 1940 games, fulfilling the dream of Japan’s first IOC member, Kano, and creating a halo effect of national pride. 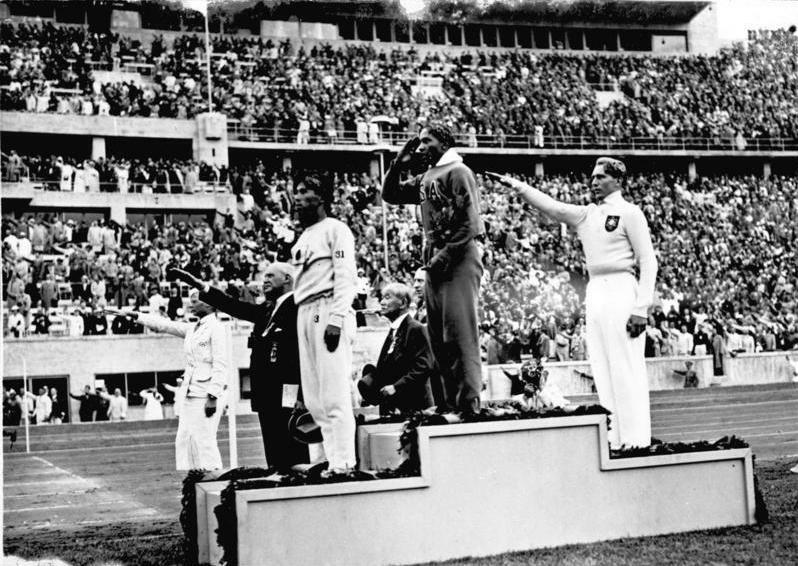 The games that followed in 1936 in Berlin, often dubbed ‘The Nazi Olympics’, were controversial, but included some important historic Japanese milestones. The swimmer Hideko Maehata (1914-1995) became the first Japanese woman to win a gold medal in the 200-metre breaststroke. Her race also made Japanese broadcasting history and turned the radio commentator Sansei Kasai (1898-1970) into a celebrity and national icon. The race was broadcast live by radio across Japan, and had to be extended so that it could be followed right until its dramatic finish, which ended with Maehata winning by a few tenths of a second. The overexcited Kasai cheering on the Japanese swimmer as the live broadcast ends, makes it rather hard to figure out if she had in fact won and was still in the lead right at the finish. You can still sense the anticipation and excitement today, when listening to the recording. 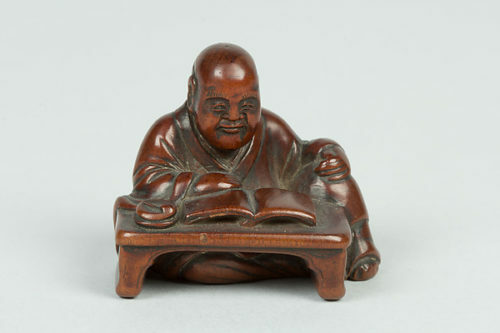 The Japanese poet and lyricist Yaso Saijo (1892-1970) also attended the games, not as an athlete, but as a ‘literary observer’, and wrote about his experience. He is best known today for a bizarre Internet YouTube-based meme associated with his poem, Tomino’s Hell, published in a 1919 poetry collection, which has been viewed and performed hundreds of thousands of times online in English. According to modern urban legend, if you read this cursed poem out loud, which thousands of foolhardy individuals have recorded themselves doing, terrible things will happen to you, including possibly death. Nonetheless, Saijo’s comments in an article published after the 1936 Olympics are poignant and highly interesting. They read almost like an Olympic curse. ‘The Berlin Olympics were merely a drama in which Hitler played a leading part and all the athletes played subordinate parts’, he writes, going on to recount a conversation he had with a German poet: ‘ I’d like to be able four years from now to visit your country for the Tokyo Olympics, traveling around writing poetry as you have done, but, regrettably, by that time both your country and mine will probably be hosting an Olympic artillery and machine guns’. 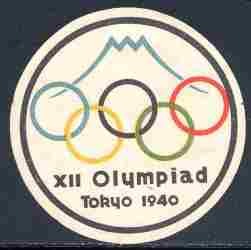 Vignettes known from the Tokyo 1940 Olympic Games. Image: Olympic Games Museum, Germany. As predicted, war did escalate. And inevitably, a decision was made to cancel the 1940 Tokyo Olympics, which are now sometimes referred to as The Missing Olympics. Kano, who probably suspected that this might happen, would have been devastated by the decision, but he died in May just before the decision was formally made and announced on 15 July 1938 by Japan’s Vice Minister of Welfare. Ironically or perhaps deliberately The Fruits of Olympus by Tanaka was published in 1940. It wasn’t an entirely false start, but this Olympic dream alongside Japan’s plans for ‘strategic international expansion’, and its initial modernisation, collapsed, causing personal tragedies for millions across the region, Japan, and internationally. Perhaps the famous comment by the author Ryunosuke Akutagawa (1892-1927) – ‘life is an Olympic game sponsored by a bunch of lunatics’ – should be considered a prediction. fter the peace treaty was signed in San Francisco on the 8 September 1951 bringing an end to the occupation of Japan that followed the surrender, Japan was able to rejoin the Olympic movement and send athletes to the Olympic Games once more, this time to the Helsinki games held the following year, in 1952. In Munich, in 1959, the process was restarted and a new ‘First Tokyo Olympics’ was proposed. This time Tokyo was up against three very different cities, one of them an American one for the first time: Detroit, Vienna and Brussels. Tokyo was successful again in its bid, this time to host the 1964 Olympics. Since that decision in 1959, Japanese cities have been awarded the right to host the modern-Olympic Games more often than the cities of any other non-Western nation. Only the United States and France have hosted more Olympic Games (summer and winter) than Japan. 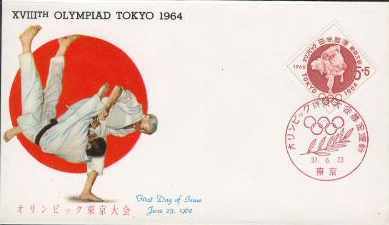 Tokyo Olympics Stamps. First Day of Issue 23 June 1962 Image: Olympic Museum, Germany. Kano would be delighted and stunned if alive today by this and also that the sport he founded, Judo, which he developed, modernised and ‘sportified’ out of traditional Japanese martial arts, such as Jujitsu, is now an international sport, and has even become an official Olympic sport. It would surprise him, perhaps even more, that it is also the favoured sport of the current president of Russia, a country Japan had defeated in battle just before she joined the IOC. 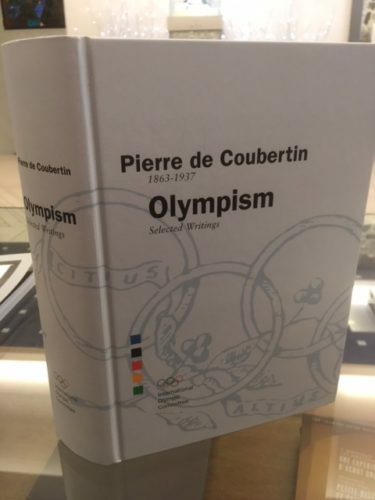 Book of selected essays and speeches by the French educator and historian, and founder of the International Olympic Committee (IOC) Pierre de Coubertin. He is credited with the creation of the modern Olympic Games. Photograph: Red Circle Authors Limited. Vladimir Putin, the Russian president whose Judo skills, including his black belt, are now used for personal and national propaganda, has even written a book on Judo, the sport Kano created, entitled Gentle Way, that has been distributed to seven million Russian schoolchildren with a manual entitled The Art of Judo. Perhaps Putin’s book should be included, alongside books by the IOC’s first president and others, within the corpus of Japan’s Olympic literature. Like Kano, the poet Saijo has his own unique Olympic legacy, though it is less well known – and unlike Judo or his famous ‘cursed poem’, one that is still unknown to most. Cover of the official report on the 1964 Tokyo Olympics by the Organising Committee. He wrote the lyrics to accompany music composed by Roh Ogura (1916-1990) for the 1964 Olympic Closing Ceremony. Their short Tokyo Olympic Hymn B, published in full in the official post-games literature, was performed as the Olympic flame slowly disappeared, before the Olympic Anthem was performed and Auld Lang Syne sung by all. His Japanese hymn starts: Because I Stand Here, I Can Shout Victory. No longer a wartime enemy, Japan was able to stand as peers with its former enemies, and happily host the games in its capital city. The decision to host the games took place less than six years after Japan signed the peace treaty officially ending, from its perspective, a war it lost; that killed millions of its own people and those of other countries. A war – a manmade disaster that ended up destroying most of its infrastructure and an estimated quarter of its national wealth; a war that created scarcity in almost everything in Japan, with the exception of poverty, which was widespread. Despite this, 13 years after signing the treaty, Japan proudly became the first Asian nation to host an Olympic games; it also rejoined the United Nations and built new train lines and subways; including its famous bullet train, which opened to customers 10 days before the Olympics commenced. Tokyo was visibly changed: clean, modern and hygienic; and was rebuilt and ready, as it had been in the late 1930s following the devastating natural disaster of the 1923 earthquake. s it turned out, Tokyo wasn’t quite ready. There weren’t enough hotel rooms; and rooms had to be made available in private homes and on passenger ships berthed at Harumi Pier in Tokyo. 1,445 beds were made available in 588 private homes. A great deal of these were taken up by American, British and Australian athletes – creating precious memories for many, and even a little romance for a few. Thousands of people also stayed at and visited the Olympic Village. According to the official records, the cumulative number of nights stayed at the village by athletes and officials was a staggering 172,610. People came from more than 90 different countries. Among them were 4,500 Japanese news and media personnel, and 2,000 international media professionals – all of whom generated a huge amount of copy for world consumption. For the very first time, the world had descended on Tokyo, the world’s largest city at that time. 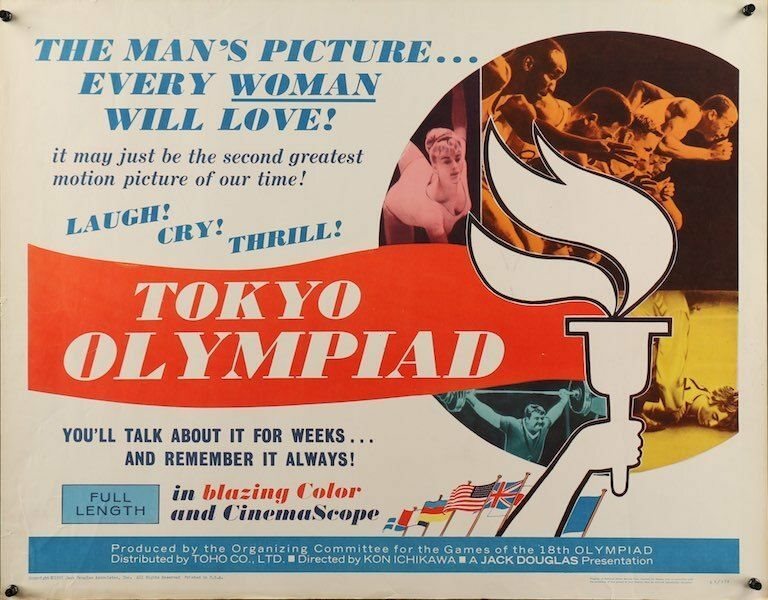 The atmosphere was beautifully captured by the documentary Tokyo Olympiad, directed by Kon Ichikawa (1915-2008). Initially a budget of US$1.5 million (550 million yen) was recommended on the advice of Japan’s legendary film director Akira Kurosawa (1910-1998). But this was eventually reduced to US$805,556 (290 million yen) with Ichikawa rather than Kurosawa directing. The film documents some of the events, such as the marathon, in an artistic fashion that must have delighted Saijo. The film involved seven different firms, but was controversial, as it wasn’t a propaganda piece promoting Japan and its new infrastructure that the authorities were expecting. Instead it highlighted the dedication and performance of the athletes participating. Nevertheless, over time the film has been hailed as a masterpiece and has become a firm favourite amongst documentary and other film buffs. While disasters and tragedies evoke drama and emotion, and will generally generate a huge amount of publicity, positive stories do not as a general rule receive anywhere near as much attention in the media. Sometimes it takes a major milestone, like the Olympics, for the media and individuals to focus on positive stories. For Japan’s leaders and its media, 1964 was not a coming out or debutant’s party. It marked Japan’s return: an opportunity to showcase its capabilities and values as a modern nation as it had originally intended 24 years earlier, while also drawing a line under its recent past. Japan’s speed of development and progress was breathtaking, but it came at a price, with many personal and environmental tragedies along the way – some of which found their way into the narratives of books by some of Japan’s best writers. As Japan grew in confidence as a nation, so too did its creative writers. A cluster of them were now getting international recognition and receiving nominations for international literary awards. 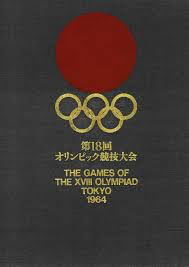 The first Japanese Olympics, 55 years after Kano became the first individual from Asia to join the IOC, was a tremendous opportunity to create a new cultural legacy and some decided to pick up the literary baton from Tanaka and use the global stage of the first Olympics on home territory to cultivate new and less perishable literary fruits. In fact, 1964 was a turning point, not just a novel one that academics and historians could analyse Japan from, it was marked by a handful of important new novels and the birth of a prodigious new literary talent; and a novel that would eventually help lead to a Nobel Prize.